"Cancer Disparities: Causes and Evidence-Based Solutions" is the first book to examine the racial, socioeconomic, and biological factors that influence cancer incidence and survival, and is a major contribution to the cancer and health disparities field. This title is co-published by the American Cancer Society and Springer Publishing Company, and edited by Drs. Ronit Elk and Hope Landrine. 'We hope this book will help raise awareness about the impact of cancer in minority communities and to encourage individuals to take action,' said Otis W. Brawley, M.D., Chief Medical Officer for the American Cancer Society. "Cancer Disparities: Causes and Evidence-Based Solutions" is the first book to examine the racial, socioeconomic, and biological factors that influence cancer incidence and survival. The comprehensive guide, co-published by the American Cancer Society and Springer Publishing Company, also presents 15 previously unpublished, evidence-based interventions to reduce and eliminate cancer inequalities. The volume promises to be a significant contribution to the field of cancer and health disparities. Cancer disparities have become an issue of increasing interest and concern, with studies clearly showing significantly higher cancer incidence and mortality rates for ethnic minorities and populations with low socioeconomic status. These persistent disparities represent both a medical and a moral challenge that this volume acts to answer. 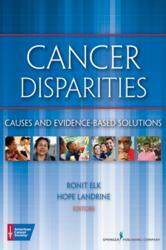 The book explains the nature, scope, and causes of cancer disparities across different populations, including African American, Hispanic, and Native American populations, among others, as well as addresses incidence and response of various types of cancer, including breast, colorectal, cervical, and prostate. It presents unique programs proven to reduce inequalities in cancer prevention, screening and early detection, treatment, and survivorship. "'Cancer Disparities: Causes and Evidenced-Based Solutions' provides real-life examples of how barriers to cancer prevention, care, and information can be reduced or eliminated," said Otis W. Brawley, M.D., Chief Medical Officer for the American Cancer Society. "We hope this book will help raise awareness about the impact of cancer in minority communities and to encourage individuals to take action." For more information on this book, to request a review copy, or to schedule an interview, please contact Dara Salem at dsalem(at)springerpub(dot)com or 212-431-4370 x211. A pioneer in health care and social science publishing, Springer Publishing Company is known as an innovative public health, nursing, rehabilitation, psychology, social work, counseling, and gerontology publisher. The company has won numerous awards, including the American Journal of Nursing Book of the Year Awards, the ALA Choice Awards, and the AAP PROSE Awards, and offers more than a hundred top quality titles annually, in addition to more than twenty journals. From nursing to psychology, Springer Publishing Company is passionate about providing the best textbooks, guides, professional books, and reference works to instructors, professionals, and students. For more information, visit http://www.springerpub.com.